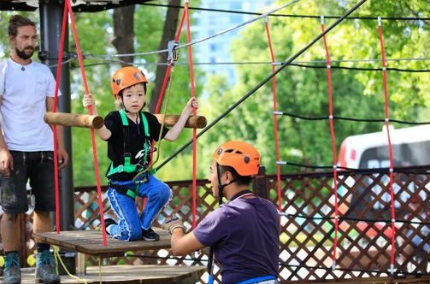 Magic Jungle is a high rope course imported from Germany by Wanhang Tourism Shanghai Ltd. Locating in the famous north bund in Hongkou district, it is established as a new icon for new sport choice in Shanghai.It is composed by a 13-pole structure of high rope programs, including 94 elements of different difficulty levels. Highlights program like Giant Swing, Crazy Slide and Low Altitude Jump are of the most popular plements around the world.